Favourite Places To Sip And Snack In Vancouver!! 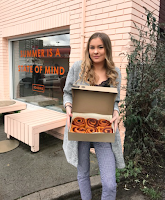 This week I'm sharing a couple of my favourite places in Vancouver to sip and snack!! This place seriously has the best cinnamon buns that exist! They have really great icing and are so super soft and fluffy. Grounds for Coffee is located in Kitsilano and has a cute cafe feel to it. Body Energy Club is an absolute staple in my diet/eating regime. Their smoothies are so filling and have such great ingredients as well. I have a location right by my house which is super convenient. They have a lot of locations in Vancouver so if you live in the Vancouver area, I'm sure you have a location close by you too! Check them out for sure next time you walk by.